Why can’t I print to my wireless printer? Fort Wayne Computer Repair | Shane Grantham Consulting, Inc.
Last week a long-time computer repair client emailed me when they couldn’t print to their HP wireless printer from a Microsoft Windows 10 laptop. During our communication, I found out a Windows 7 desktop computer couldn’t print either. I arrived on site and opened devices and printers on the Windows 10 laptop. No printers were listed which is a problem. Then I noticed the laptop’s airplane mode was active so no wireless communications would work. I turned it on and allowed the laptop to connect to the wireless router. In devices and printers I found a Brother printer which was no longer present and I deleted it so it didn’t cause problems. I attempted to add the HP printer with “Add new printer- wireless or bluetooth. “The HP OfficeJet Pro 6978 (wireless) wasn’t listed. I tried to discover it many times without any success. Focus was now on the wireless printer to see why the laptop can’t see it. I noticed the printer’s wireless LED was blinking which means there is a problem. My smartphone and the laptop sees the WiFi router but the HP wireless printer does not!. I even entered the 5G and 2G networks in manually but the printer wouldn’t accept them so I concluded the wireless part of the printer had failed. The solution was to directly connect the printer to the wireless router with an Ethernet cable so all computers on the network could print to it. 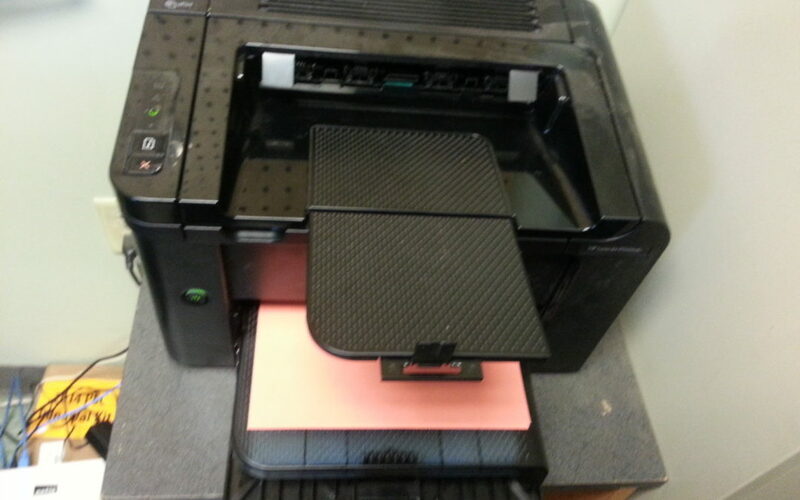 And luckily, the printer will always be near the wireless router so the Ethernet cable works. My client was glad to be able to print again and I was reminded that wireless networking can be mysterious and challenging at times as it was today. Ugh. Printers are more frustrating than they need to be. I tend to just buy a new printer when I start having issues. For less than the cost of new ink sometimes it’s worth it. Unfortunately, now I have 4 printers and I can only print to one. Thanks Aimee for the comments!